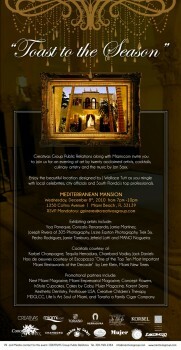 Media, celebrities, influencers and guests will enjoy bites courtesy of Escopazzo Restaurant (included in this yearâ€™s New Times as on of the â€œTop Ten Most Important Miami Restaurants of the Decadeâ€- per Lee Klein and cocktails courtesy of Korbel Champagne, Herradura Tequila, Chambord Vodka and Jack Daniels. Other partners in this event include Miami.com, Next Miami Magazine, Miami Empresarial Magazine, Concept Flowers, InStyle Cupcakes, Cakes by Gaby, Mujer Magazine, Karent Sierra Aesthetic Dentistry, Printhouse USA, Creative Childrenâ€™s Therapy, Life Is Art, Soul of Miami, and ToraÃ±o Cigars. South Beach is about is to get a bit more exotic as the Mediterranean Mansion is ready to open its doors. Hidden away in the heart of South Beach and nestled amongst the Art Deco buildings that make South Beach famous is this hidden gem that brings a different element to the Magic City. 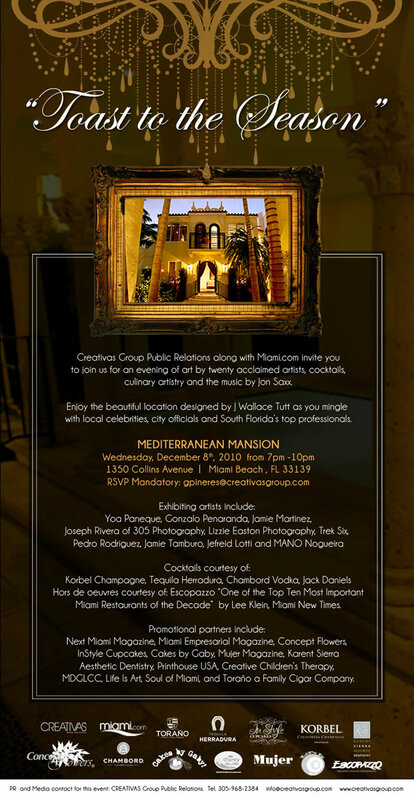 The Mediterranean Mansion is a change of pace to the typical hotels and event spaces found on South Beach during a time when â€œnon-traditionalâ€ event spaces have become extremely popular and well sought after. The venue will open its doors during a cocktail party this December 8, 2010 from 7:00PM-10:00PM. The Mediterranean Mansion is a magnificent work of architecture. Originally constructed in 1931 the mansion was later redesigned by the legendary J Wallace Tutt. Tutt who designed Casa Casuarina (formerly the Versace Mansion) sadly passed away shortly after putting his final touches of genius into the mansion. Tutt was quite proud of his last project which boasts three separate two story buildings that are designed with an ancient Italian-inspired aesthetic, complete with whitewashed stone and Mahogany wood-upholstered trim, offering a total of 8,800 square feet of luxurious living space. Located at 1350 Collins Avenue, on Miami Beach, one would never know that behind a modest iron gate stood a magnificent piece of art know as the Mediterranean Mansion. As one walks through the unassuming gate you are immediately transported from South Beach to an exotic Villa in Italy. Once greeted by a 2,500 square foot courtyard adorned with palm trees and tropical shrubbery one feels in a state of relaxed bliss. Within the courtyard lies a covered heated swimming which adds another element to the already relaxed and tropical environment. The courtyard lends itself to an amazing array of events including weddings, cocktail events, and corporate functions. For those who are looking for an overnight stay in the heart of South Beach with all the luxury and without all the fuss that goes along with South Beach the mansion features and interior that is sure to fit the bill. The location is now available for those wanting to stay at a luxe location minus the pretentiousness. The Mediterranean Mansion was designed with comfort and luxury in mind. The three-in-one villa features five independent mansion suites which are worthy of being called a J Wallace Tutt project. The main house includes a master suite, private movie theater/media room which features a 96â€™ projection screen, open air office, guest bathroom, dining room, and a fully functional European style kitchen which is large enough for multiple chefs. The guest house which comprises two guests suites, both with en-suite bathrooms is perfect for entertaining as the first floor features a billiard room with wet bar. The third building offers two suites with en-suite bathrooms and an 800 square foot wine cellar which is situated in the basement. The Mediterranean Mansion was successfully designed to be an alternative space in the city of fun and sun. The Mansion offers the sights and sounds of a secluded Villa in an exotic country while being just a few foot steps away from the trendy and white sands of South Beach. The venue invites you to plan your next event or vacation the Mediterranean way. The â€œToast to the Seasonâ€ by invitation only cocktail will feature a ribbon cutting with city officials, series of acclaimed artists including: Yoa Paneque, Gonzalo Penaranda, Jamie Martinez, Joseph Rivera of 305 Photography, Lizzie Easton Photography, Trek Six, Pedro Rodriguez, Jamie Tamburo, Jefreid Lotti and MANO Nogueira, who will show their work in unique style as all areas of the venue will be utilized as a gallery.